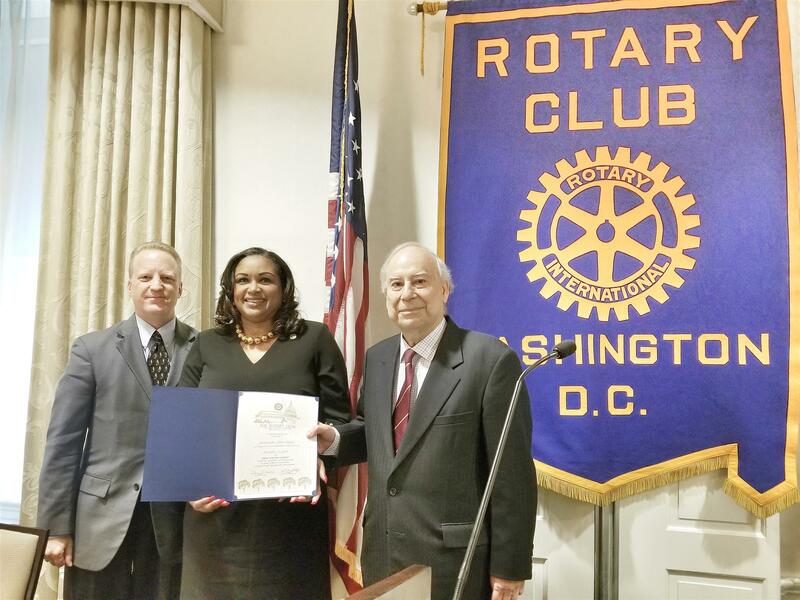 This week, the Rotary Club of Washington, DC, welcomed guest speaker Amb. Akbar Ahmed. Amb. Ahmed is the Ibn Khaldun Chair of Islamic Studies at American University in Washington, D.C.
Thomas Napier provided the Words of Inspiration, reflecting upon what it means to be good to your fellow man. The guest speaker was introduced, Amb. Akbar Ahmed. Ambassador Akbar Ahmed is the Ibn Khaldun Chair of Islamic Studies at American University in Washington, D.C. Ahmed’s career has included distinguished posts in both academia and public service. Highlights from the past four decades of Ahmed’s academic career include appointments such as: Nonresident Senior Fellow at the Brookings Institution; the First Distinguished Chair of Middle East and Islamic Studies at the U.S. Naval Academy in Annapolis, MD; the Iqbal Fellow (Chair of Pakistan Studies) and Fellow of Selwyn College at the University of Cambridge; and teaching positions at Harvard and Princeton Universities. Ahmed dedicated more than three decades to the Civil Service of Pakistan, the senior-most cadre of the Central Superior Services of Pakistan, where his posts included Commissioner in Balochistan, Political Agent in the Tribal Areas, including Waziristan, and Pakistan High Commissioner to the UK and Ireland. President Lisa McCurdy adjourned the weekly meeting with final remarks at 1:30p.m.